If your minion at home is going all miniony on you these couple of weeks and you figured he/she/you are turning yellow and blue from fastfood, perhaps you’d like to give this a go this weekend. Universal Pictures has got this little critter’s design right (with all the cutesy minion babble making its merchandise fly off the shelves) and this week’s DIY project is a tribute to this small little yellow chappie. Now let’s go BANANA*! 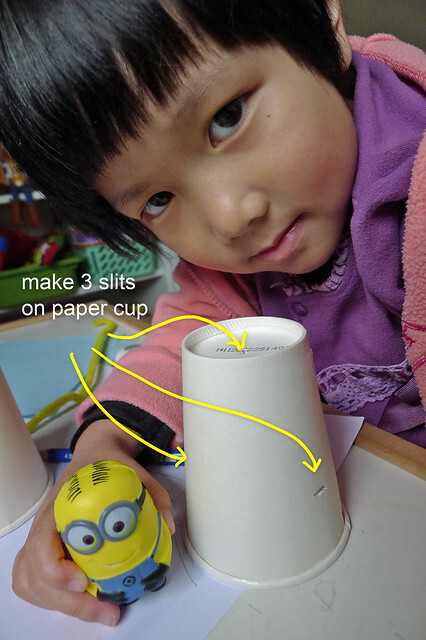 Make 3 slits on the sides and top of a paper cup. Insert a piece of pipecleaner through the sides. Insert twine through the slit at the top of the cup. 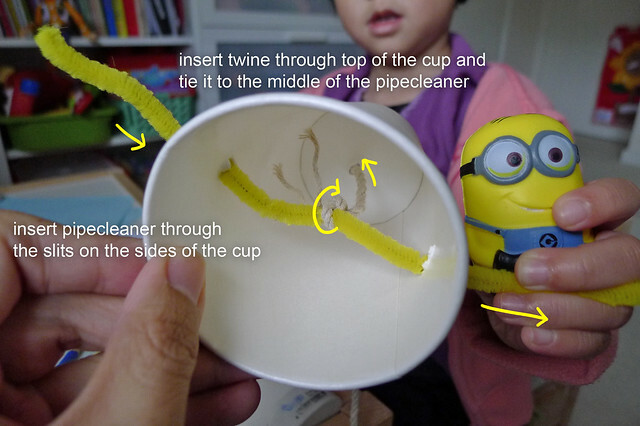 Tie the end of the twine to the middle of the pipecleaner inside the cup. 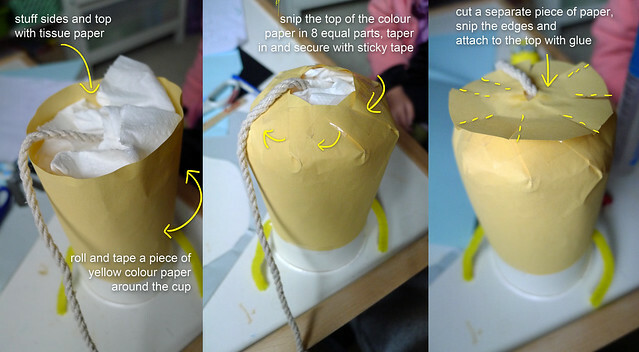 Make its body/head by sticking a piece of paper round the cup. The paper should be longer than the height of the cup as you’d need to taper them in to make the curvature of its head. Before you work on the next step, get kiddo to cut up colour paper for goggles, eye, mouth, overall. Stuff the sides and top of the cup with tissue paper. Leave about 1-2 cm of allowance between the stuffed tissue paper and the edge of the top of the paper. Make 8 equal cuts along the edge and taper them in. 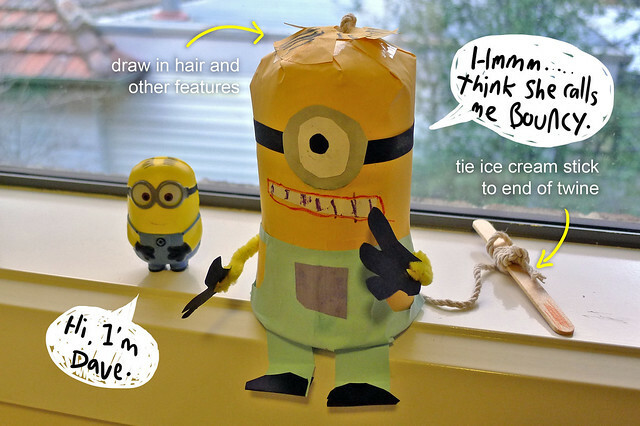 Cut a piece of yellow paper to cap the top of its head. Make sure the twine comes through the top of the head by making a small slit in the centre of the cap. 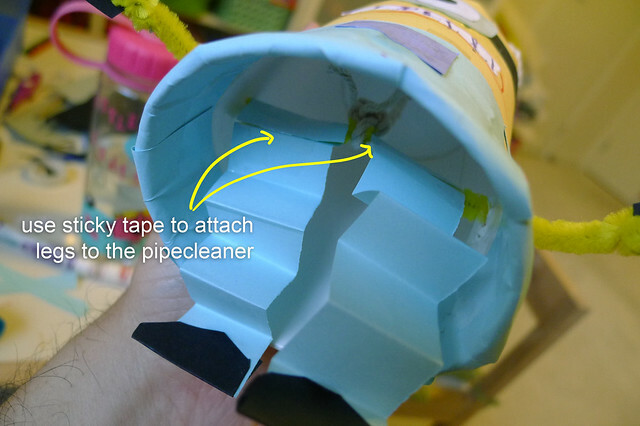 Make slits along the edge of the cap and attach it to the head with glue. Curl the edges. Cut 2 extra pieces of yellow paper and attach it on the sides. Attach the paper pieces kiddo had prepared to the body. Cut 2 black pieces of black paper as gloves (poke the pipecleaner’s ends through and fasten). Cut 2 smaller pieces of blue paper as its legs (oh, stick on some boots) and attach to the pipecleaner from under the cup. Secure the legs to pipecleaner as they must not be moving freely. Tie ice cream stick to the other end of the twine and this allows kiddo to ‘bounce’ it about/ take it for a walk. Try moving the pipecleaner/hands and the legs should swing back and forth. & there you have it! 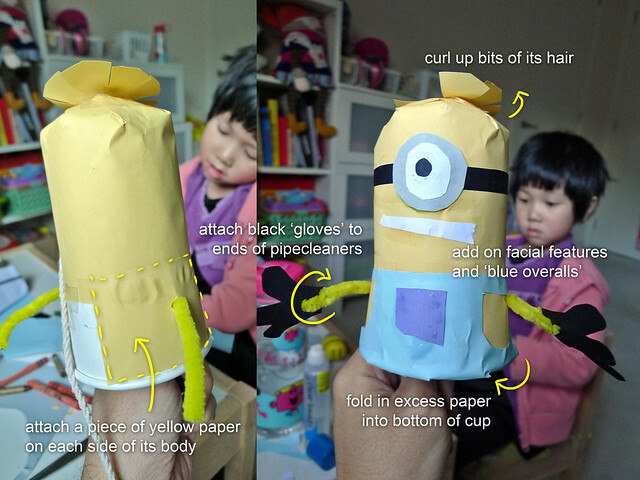 Your very own Cup-a-Minion for your little minion!